Just like humans, dogs experience significant stress, which can lead to anxiety. We have all heard of the stereotypical examples of dogs reacting to being in the car (for fear of the vet), fireworks, and entering new spaces. Fear of leaving you, large crowds, other dogs, and moving can also cause emotional issues and increase your dog’s anxiety. How do you know if your dog has anxiety? Well, since they cannot speak, you have to watch for certain cues. Dogs experiencing anxiety may bark aggressively, run around your home out of control, or withdraw trembling, hiding, or not leave your side. Any behavior that is peculiar could be a cause for concern. What can you do to ease your dog’s anxiety? Having a close bond with you can help your pet through times of change and when they have to be alone. 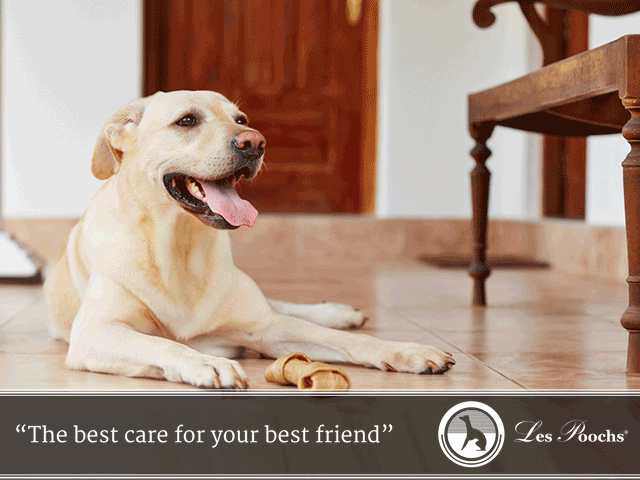 When you spend time with your dog, they know you care and will be assured you will always be there for them. However, be careful not to over-coddle your pet. Sometimes when you try to snuggle or lay too close, they may think feel threatened and that they are being attacked. A quieter environment can be helpful if your dog is stressed. This is especially important if you live in a city, or during times of extreme noise, like fireworks. Keep music and TV volumes low. Being outdoors can be one of the best things for your dog’s anxiety and help ease a stressed-out pooch. Dogs love to interact with nature, and it can help them relax by enjoying the sunshine and finding places to explore and sniff. Just like it can be for humans, exercise is a fantastic mood-lifter for dogs. Socialization is important for dogs who are stressed when around other pets. Your best friend may have a hard time making other furry friends. Take care when visiting a dog park. One bad experience could cause future problems and only increase your dog’s anxiety, so to ease into social situation, it’s a good idea to avoid aggressive animals. Always ask other dog owners before approaching too closely, “Is your dog friendly?” and then carefully observe interaction once given the O.K. Getting your dog through an anxious time can be a great bonding experience for you and your best friend. Quiet baths, playtime outdoors, and appropriate snuggle time will give them the emotional assurance they need when navigating the world with and without you. Just like babies and young children, new puppies and even older dogs can get into dangerous situations at home. We often think that our most important task when it comes to home safety for dogs is to stop them from chewing on furniture, but there are other significant safety hazards that should be avoided at all costs. While dogs do have an innate sense that keeps them away from danger, there are a few problems that owners can take measures to guard against. Bathing your dog should be a time of bonding and fun for you and your best furry friend. Make sure to keep the water at the right temperature to avoid burns, and never leave your dog alone in the water. There are many items in our homes that are safe for humans to use but not ingest — cleaners, medications, and lawn chemicals, are good examples. However, dogs explore the world by closely sniffing and tasting what they find, and they do not know what is harmful. Even sugar-free gum is a hazard if it contains xylitol, which, taken in small amounts, can be fatal to dogs. Be sure to keep these and other substances out of reach of your dog, in high cupboards or locked closets. Secure their packaging by tightly screwing lids on bottles and jars, pack any items that come in bags (which dogs can chew threw if they are interested) into tough plastic totes or pails — better yet, the kind that have locking lids. Dogs, especially young puppies, like to chew on everything. This can include electric cords, sharp objects, your mouth guard left on your bedside table, and even small game pieces. All of these items can be dangerous for your pet. Secure these items from reach while keeping a variety of safe chew toys easily accessible around your home. 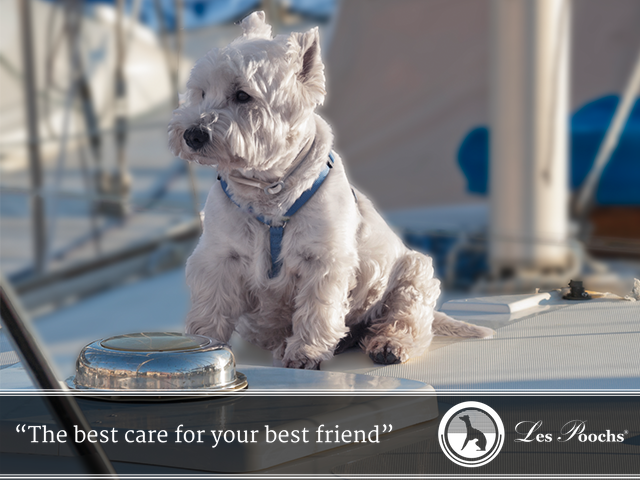 Additionally, spend time working with your pet to ensure they know what is safe. Most dogs love to spend time outside exploring in your yard. However, danger can lurk at every turn. Carefully lock down your grill, tools, lawn chemicals, and fire pit, as these are all could be dangerous to your pet. Also take note of any lattice around your deck and fencing in your hard, which could be hazardous. While some dogs like to swim, be careful that they only have supervised access if they are allowed in the water. Dogs can get into every nook and cranny of your house. It is often hard to know what new interesting smell they will go after, and how they will try to maneuver around your home in dangerous areas. Your garage is another area to look over and ensure everything in it is no danger to pets. A few cabinet locks and some other basic precautions will do the trick. When it comes to home safety for dogs, it’s better to be safe than sorry. What should I look for when selecting a dog brush? Whether you are a dog groomer or a dog owner, you share a common goal: you want to be sure you’re selecting a dog brush that makes a dog look spectacular and takes the absolute best care of their coat and fur. Following is information that we hope can guide you when selecting a dog brush. To keep your best friend looking their best, daily brushing is recommended. You want to ensure that the hair remains tangle free, shiny and as healthy as possible. If you have a breed of dog that sheds often, daily brushing will help keep the hair outside and off your carpet and floors. Make sure when selecting a dog brush, you choose one that is good for de-matting to have on hand in case you need to take care of an emergency mat situation, but also one that can handle the coat on a regular basis for maintenance brushing, to prevent as many problems as possible. 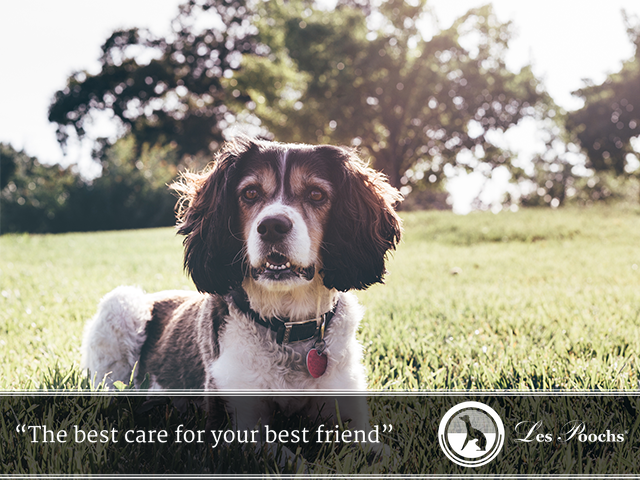 When you take care of a client’s dog, we know you want the owner to be completely satisfied with the outcome. We know your goal each time is returning a dog to its owner with a nice shiny coat that is well-brushed and completely tangle free. A good dog brush can help you do that. Since it’s done frequently and can be hard work if not done right, it’s good to have a brush that has an ergonomic quality to make the work of brushing easier on you (and on the dog’s coat!). With this in mind, it’s good to go about selecting a dog brush that fits nicely in your hands. The curve of the brush is particularly important, as it should fit your hand and feel comfortable while you are using it. 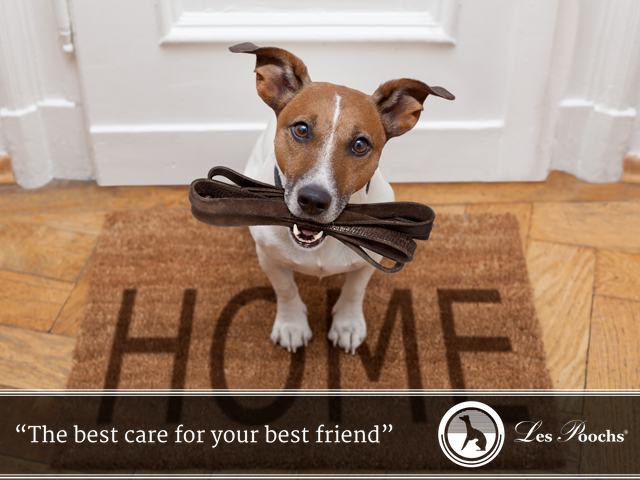 Here at Les Poochs, we have designed our dog brushes to handle all of your needs. We use tested designs, and offer a variety of options, to ensure they provide exemplary service for you, your pet, or in the case of groomers—your business. Regardless of breed of dog and the particular coat they have, you can be sure when selecting a dog brush, that our brushes do the trick to keeping dogs’ coats as healthy as possible. 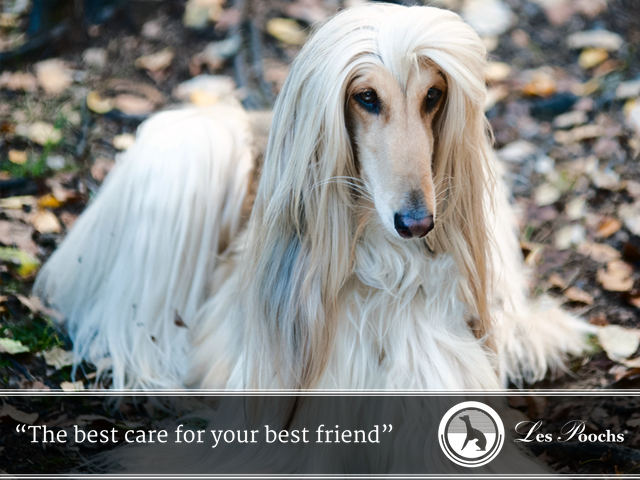 Caring for long haired dogs can be easy as long as you do simple regular maintenance so their coat can always be easily and beautifully maintained. 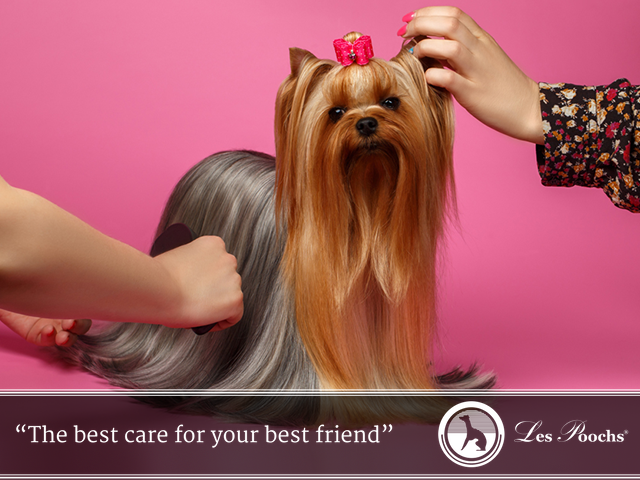 If your best friend is a long-haired dog, you know that they require a bit of extra care. You want to ensure that they look their best at all times and that their hair remains tangle and mat-free. If you have a Lhasa Apso, Maltese, Shih Tzu, or Terrier (just to name a few), you may struggle with keeping your dog’s long hair looking fabulous all of the time. 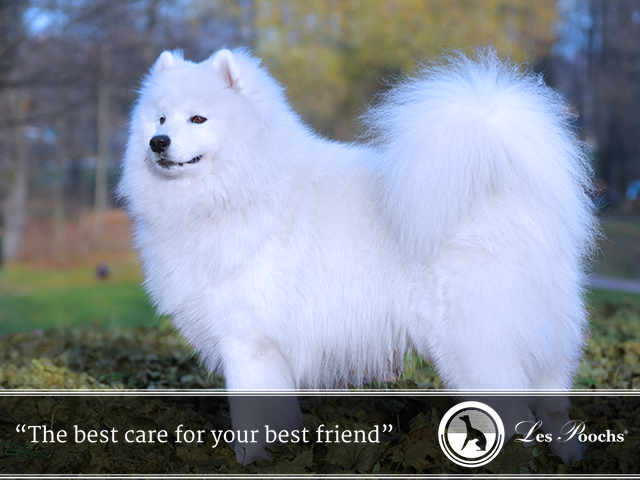 Following are some tips for caring for long haired dogs so their coat can always be easily and beautifully maintained. A regular visit to the groomers is the best way to ensure your dog’s coat remains as clean and tangle free as possible. This is especially important for long haired dogs. A good groomer has special techniques to clean the fur and work out every possible issue with long hair. In between trips to the groomer, regular bathing is important. Dirt and debris can weigh down your dog’s coat and create tangles. A high-quality dog shampoo free of soap will leave your dog’s coat clean every single time. Follow this up with a good dog conditioner or creme rinse to ensure a silky smooth coat that is free of tangles. When you are going through the process of bathing your dog, make sure to work the shampoo, conditioner, and water in well with your fingers, so the entire coat is cleaned. Caring for long haired dogs can be easy as long as you do simple regular maintenance. Long haired dogs need to be brushed every single day with a high-quality brush that works well with their particular hair and coat. Taking just a few minutes daily to brush will keep fur mat-free and looking fantastic. If you do find a mat, you can immediately use our emergency mat brush (link), which has been specifically designed to get out even tough mats of hair from your dog’s coat. We have dedicated the work of our company to ensuring you have the best products to have what you need to maintain your dog’s long hair. Should you need anything or have a question, please let us know. Selecting dog shampoo for your pet grooming salon is a balance of fitting your budget while finding the best product available. When clients entrust their dogs to you, it is very important to deliver a high quality experience and return their best friend perfectly coiffed. We understand that you are running a business and therefore want the very best quality for the price. Our shampoos are safe, effective, and allow you to deliver a beautiful-looking pet each and every time. For any dog groomer, one of the cornerstones of the grooming experience is the bath. The shampoo you use needs to outperform and satisfy your expectations as well as those of your most discerning clients. We know you have many choices when it comes to selecting dog shampoo for your salon: fragrance or fragrance-free, tearless, de-matting, de-shedding, deodorizing . . . how do you choose? You may already know that buying the cheapest shampoo available can sometimes cost you a client’s business. Additionally, buying a lower quality shampoo risks adverse reactions in pets, which will not make for happy clients. They want for their pet to have the cleanest fur and skin, the best smell, and for them to be as safe as possible. Here at Les Poochs, we know groomers. We know that you work hard for your money, and that your money should work hard for you. We also know you can be overwhelmed with many options when selecting dog shampoo to use in your business, and want to educate yourself on the important differences. It is critical that you read labels and understand each and every ingredient. When selecting dog shampoo for your salon, make sure any shampoos you choose have safe ingredients for dogs, that they do not contain soap, and that they leave a dog’s coat looking and feeling luxurious. 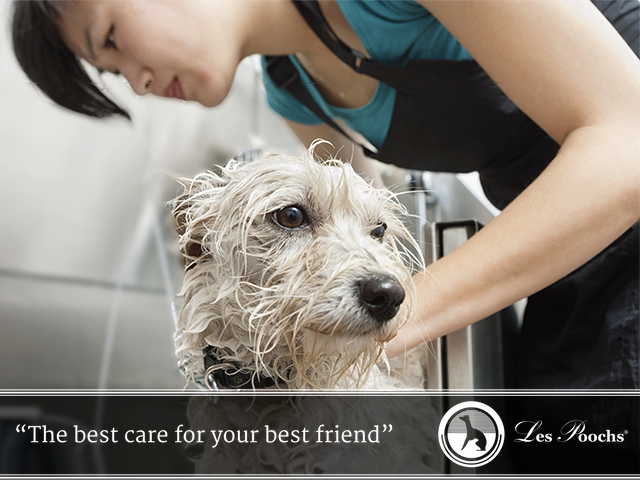 Les Poochs shampoos are of the highest quality. We do not use any soap in them, since we know that soap can be drying to a dog’s coat and skin, and leave an unpleasant residue. Instead, our shampoos contain surfactant. What is surfactant, and why is it important in a dog shampoo? Surfactant-based shampoos promote lather and do not produce any suds at all. This is advantageous because suds and bubbles from soap are what causes residue and dandruff (dry, flaky skin) on a dog coat. Our shampoos will give your clients’ pets the shiniest coat possible. You will also find that our shampoos are luxuriously fragrant, but not overbearing, with a pleasant and fresh scent. Following is some info about dog perfume that you may not know about. When you have a posh pet, you want them smelling fresh, clean, and luxurious every single day. You may be tempted to spray your favorite fragrance on your best friend and have them match you! However, that is probably not a good idea. The perfume you use was specially formulated for human skin — both in terms of odor and safety. Dog perfume is specially formulated to interact with a dog’s skin and natural smells, much in the same way. Our team of perfumers, chemists, and pet industry professionals created our safe dog perfume to give your dog days’ worth of fresh scent. The scent you get from a perfume or fragrance might not smell the same as when you whiff it from the bottle. When you spray a perfume onto skin, clothing, or fur, it mixes with the oils, dust, and lotions, which may alter the scent. The same is true for how scents work with a dog’s fur, as well as its skin, and natural odors. Here at Les Poochs, all of our products are formulated with only dogs in mind. When it comes to dog perfume, don’t forget that your dog’s nose needs to be considered, as well. With dogs’ magnified sense of smell, you want to ensure that the fragrance is pleasant to them, as well. Our dog perfume’s creators took great care to ensure quality ingredients correctly balanced for safety, and are the perfect scent. 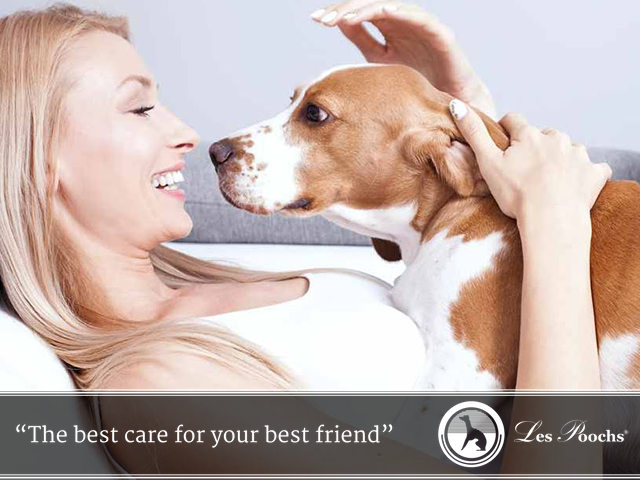 They boast light scents that ensure that your pooch remains smelling fresh and pleasant. We know not every owner wants their dog smelling the same way, so we have a variety of choices of dog perfume (for females and males, as well as for puppies). It is also about making sure that the highest quality ingredients are used to ensure their skin, coat and nose are all protected. 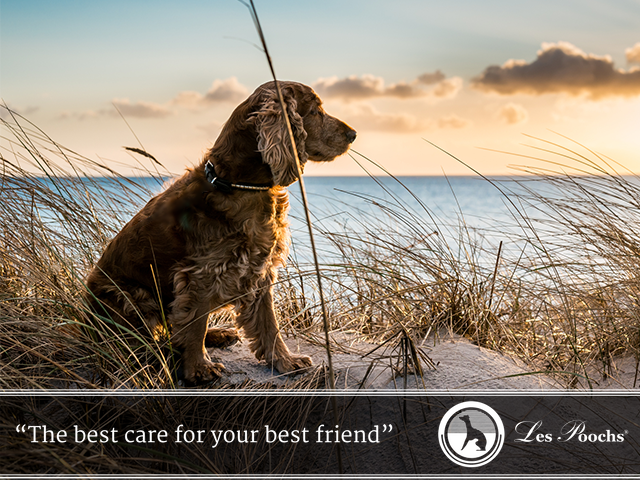 Your best friend deserves the very best. Handling dog tear stains can be a struggle. You want your pet looking his or her best, but also want to make sure you are using specially formulated products to handle the problem safely. A few years ago, the FDA shut down the distribution of tear stain removal products due to unsafe ingredients. When your dog has tear staining, it means that they have overactive tear production, which causes the spots under your dog’s eyes. Certain breeds of dogs such as Shih Tzus are more prone to the condition, and it can be more obvious when dogs have light-colored fur around their eyes. A good first step to safely combat the problem is to discuss the situation with your vet and pet groomer. These trained professionals can ensure that the tear production is normal, not harmful, and not the result of an underlying medical issue that needs further investigation. Diet, exercise, and even certain medications can help alleviate any problems. How long does it take for tear staining to clear? Usually about three weeks. Can you prevent tear staining? Carefully and gently washing under your pet’s eyes with a damp soft cloth each morning is a good way to start. Your groomer and veterinarian may have other safe suggestions for keeping the area clean. No breed of dog is completely immune to tear staining, so don’t worry too much that there is something wrong with your dog. A bit of preventive care and close attention to the under eye area will keep your best friend looking their absolute best! During the summer months, it is fun to go on a vacation with your pet. Many of us head to the beach for a day trip or an extended stay. If you visit a dog-friendly beach, your dog is going to love running in the sand, chasing seagulls, and might even charge right into the waves. Salt water safety for your dog – Is salt water safe for their fur and skin? We always recommending checking with your groomer and veterinarian before exposing your dog’s skin and fur to a new experience. Generally, salt water can be safe for your dog’s fur and skin. But before you let your dog play in the water, make sure to bring towels and shampoo with you to ensure you remove any salt water and sand, which can be irritating. Additionally, as a precaution, be very careful not to allow your dog to play in the water too long. As with humans, salt water is dangerous for a dog to consume, and can result in dehydration and ingestion of other substances that are toxic to their internal systems. Make sure your dog is well-hydrated before entering the water and watch closely to make sure they are not swallowing the salt water as they play. You may also find yourself spending time poolside this summer, and wondering if it is safe to let your dog swim in chlorinated water. Check with your vet and groomer for your dog, and if you get the OK, then they will probably love a dip in the pool. However, be sure to rinse them off immediately after swimming, and also give them a good brushing.